Are the roads clear enough with realistic turns and hills? What is the status of the terrain, is it loose gravel or slippery mud? Are there low-lying cables and tree limbs? Is transport best during dry season because of the muddy roads to your land. Have you budgeted the high cost associated with the shipping and handling of a container? Lets Talk about Transportation ……..In most Countries the client is usually charged per mile or per kilometer for the transportation costs. By doing a little bit of research. How to Transport a shipping container and/or a shipping container home. Transporting shipping containers around the Country and or around the world requires a few important things. 2. Having the drivers cell phone number. 3. Understanding the terms of delivery and removal of the shipping container. The CLIENT will deposit a “holding deposit” in dollars into our companies account in the amount of to hold container. This is a non-refundable deposit.The CLIENT will then deposit the outstanding amount as listed in the contract in order to release the shipping container. Then the client will be notified on the day of delivery before the shipping container is loaded upon the trailer. Upon the confirmation of the deposit the trailer will begin it’s transport.The CLIENT will be responsible for the transportation costs, This money will be deposited in the proper account before the delivery day. Our company guarantees the safe delivery of the clients shipping container. Our drivers are not permitted to accept cashThe CLIENT must have either a crane or a backhoe with the proper chains to lift the shipping container off the trailer on the day of delivery. This crane/backhoe must be at the destination before the deliver. The CLIENT will be charged for any additional time incurred by the driver for waiting on the removal and installation of the shipping container. If for any reason the road is impassable due to any poor road conditions and/or sharp impassable turns, then the driver will need to unload the shipping container as close to it’s final destination as possible. Therefore our company and the driver are not legally bonded to an exact physical location. 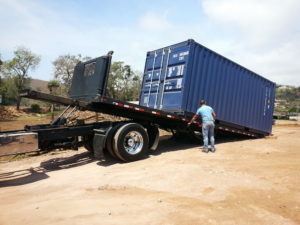 The owner will need to solicit a different temporarily location for the shipping container to be unloaded and then recovered by the CLIENT means.